I feel guilty. I worry about climate change but I like fast CO2 spewing cars too. It gives me angst attacks. A group of us zipped down in our sporty cars last Sunday morning to the Goodwood Motor Circuit to participate in the Goodwood Breakfast Club. The theme this month was supercars. The idea is simple. 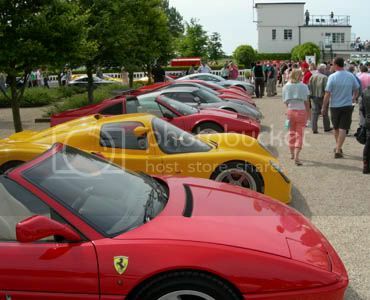 If you arrive at the circuit and your car belong to the month's theme, you park in the viewing area outside the cafe. If your car doesn't fit the theme, you park with everyone else. Our friend driving a Lotus Espirit got to park in the supercar area. The two of us driving Porsche's had to go with the rest of the punters. The event is completely free if you don't count the £12 for a full English breakfast. There's a van selling bacon rolls too. Lots of people show up driving plenty of exotic cars. There was every kind of Ferrari from very old right up to an Enzo. Lots of Lambo's. Even a Pantera. A few Cobra's. A Viper and a Noble. In the picture, you can see a yellow Ultima. One of a few that were there. I've been doing a little research about what it takes to build one of these beauties. There were a few Aston Martins and Porsches but they were mostly excluded. However, there were two (two!) of the latest Porsche Carrera GT's. Gorgeous. There was even the DeLorean from the film "Back To The Future". Wandering around the regular parking lot can also be fascinating. Plenty of Caterhams, Elises and Porsches. Various kit cars and classic cars too. A Radical was there. So was an Ariel Atom (0-60 in 2.91 seconds). As we left, a thunderous Harley Davidson Motorcycle Club arrived. It's just a great day to watch people arrive and leave. If I ever start doing a lot of commuting again, I'm quite sure I'll have to give up the Porsche and go for a two car solution: something practical that gets many miles per gallon and something else that's strictly for weekend fun. That will help keep the angst down.